The new South Course at Arcadia Bluffs in Arcadia, Michigan is taking shape into the architectural vision of Fry/Straka Global Golf Course Design. 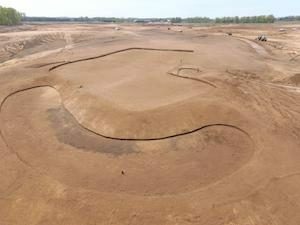 Initiated in early April, the earthwork and shaping process is now fully underway on the open 310 acre site. Upon completion, grassing will commence and the course will open in 2019. Designed as a low-profile course that is a throwback to the style of golf courses that were built in the late 1800’s/ early 1900’s, the course will feature wide fairways and flat bottomed bunkers with steep grass faces that at times jut out into the center line of play with several routes into the greens. In addition, the greens will feature many false fronts and squared off edges, with different quadrants of the green being protected by steep slopes. The incorporation of this design will require the golfer to hit his approach in the right location in order to have a birdie putt. The greens, tees and fairways will be 007 Bentgrass, and the primary roughs will be 90% turf type tall fescues and 10% bluegrass. The course will also include vast native areas between the golf holes, made up of two fine fescues (Quatro and SR3150) and hard and sheep fescues.